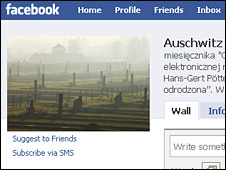 The Polish authorities in charge of Auschwitz have launched an official site for the former Nazi death camp on the social networking website Facebook. A spokesman said the move was aimed at reaching the younger generation and educating them about the Holocaust. It follows the launch by Auschwitz - now a state museum - of a YouTube channel earlier this year. More than a million people - 90% of them Jews - were murdered by the Nazis at Auschwitz during World War II. "We're always trying for new ways of reaching people, and in today's world one of the most popular tools is the internet, and on the internet millions of people use Facebook," said Auschwitz Museum official Pawel Sawicki. More than a million people have visited Auschwitz so far this year, the majority of them young people. "If our mission is to educate the younger generation to be responsible in the contemporary world, what better tool can we use to reach them than the tools they use themselves?" said Mr Sawicki. The Facebook page contains news and information about the museum, links to its YouTube channel and official website, and a discussion board. The first topic is about whether Auschwitz should have a presence on Facebook. "The Facebook page will provide a place for discussion which is not available on the official website," said Mr Sawicki. "We want it to be a place of discourse but of course we won't let anyone do anything that may abuse the memory of the victims and this place. "So far, it's just an experiment. We'll see how people react," he said.